Ten people have been killed in a suicide bomb attack near the compound of Afghanistan's intelligence agency in Kabul, officials say. Another five people were injured when the attacker, who was on foot, blew himself up as agency employees were on their way to work. Sunni Muslim militant group Islamic State said it was behind the attack. 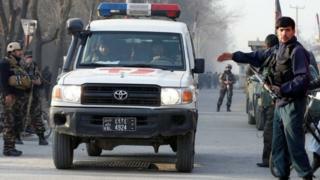 The director of hospitals in Kabul said the number of casualties could rise. Last week, Islamic State (IS) also targeted a training centre belonging to the intelligence agency. The jihadist group has been active in Afghanistan since January 2015.